Sigma has introduced two new compact system camera lenses, almost a year after announcing its intention to manufacture third party lenses for hybrid models. The lenses will be available in Micro Four Thirds mounts for Olympus and Panasonic and E-mount for the Sony NEX-series. First to enter the range is the 30mm f/2.8 EX DN lens and the 19mm f/2.8 EX DN lens. Both lenses are equipped with Sigma's Super Multi-Layer coating, which is designed to reduce flare and ghosting while still providing sharp and high-contrast images even when shooting at maximum aperture. The lenses also use a newly developed linear autofocus motor, which moves the unit directly, without needing gears or other mechanical parts. This enables accurate and quiet autofocusing, which also helps when recording video. On Micro Four Thirds systems, the 30mm lens has an equivalent 35mm focal length of 60mm, while on the APS-C sized E-mount system, the effective length is 45mm. It has a minimum focusing distance of 11.8 inches and a maximum magnification ratio of 1:8:1. Featuring two glass moulded aspherical lenses, including a double-sided aspherical lens, Sigma claims that the lens provides excellent correction for all types of aberration. An inner focusing system to correct the fluctuation of aberration to maintain image quality regardless of the focal distance is also included. A rounded, seven blade diaphragm also delivers smooth out of focus (bokeh) areas. Meanwhile, the 19mm lens has an equivalent view of 38mm in 35mm terms on Micro Four Thirds cameras, or 28.5mm on E-mount cameras. It has a minimum focusing distance of 7.9 inches, and a maximum magnification ratio of 1:7.4. Three glass moulded aspherical lenses provide correction for distortion, colour aberration and field curvature. Again, a seven-blade diaphragm has been included for pleasing bokeh. 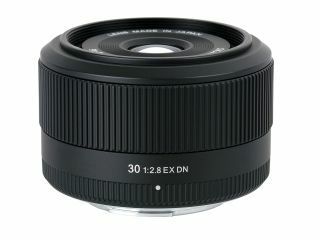 The Sigma 30mm f/2.8 EX DN and Sigma 19mm f/2.8 EX DN UK prices are not yet known, nor is availability.